The schedule has been set for this summer’s Junior Grange Camping Program. Registering early is the best way to secure a sport for a child in your life to experience a week of fun, safe and wholesome activities. Thanks to the Richard Kimball Memorial Fund, we will again offer partial scholarships for first-time campers. Application information is provided below. Each camp will feature a week of fun activities including music, hiking, swimming, special program, games, crafts, and Junior Grange instruction. It is not necessary for children or their parents to be Grange members to attend camp. Eligible ages are 9-14 years. Although each camp is administered separately by a board of directors, each requires a signed medical permission slip from parents, a completed registration form and pre-payment of camp fees. Pamphlets for each camp are available from Granges, county deputies, the camp coordinators, or directly from the State Grange headquarters in Olympia (360-943-9911 or 800-854-1635). Also, brochures on the camps and all forms are available on the State Grange website (www.wa-grange.com/JuniorCamps.aspx). One may also call the individuals listed below for each camp. There are a number of camperships available for first-time campers. These camperships will pay $75 each, which is approximately one-half of the camp fee. These camperships are made possible by the Richard A. Kimball Memorial Fund. Prospective campers who have never attended any of the Junior Grange camps simply has to write a letter of interest in securing the campership and sending it to the Washington State Grange, PO Box 1186, Olympia WA 98507. An application form for the camperships is available on the State Grange website; follow the link for the Richard A. Kimball Memorial Camp Scholarships on the site’s front page. Donations to this special fund are still being accepted. Registrations for Camp Wooten, June 23-28, can be sent to Wooten Junior Grange, PO Box 3033, Pasco WA 99302. The registration fee is $180 if paid by June 1. Checks must be made out to Wooten Junior Grange and sent with the registration form. Camp Wooten is located near Pomeroy. The camp director is Deena Stallings, (509) 521-1340 or email campwooten1@gmail.com . The fee for Mayfield Junior Grange Camp, located near Mossyrock, July 21-27, will be $175 for registrations received prior to June 15 and $200 for late registration. Checks should be made out to Mayfield Junior Grange Camp and send with the registration and medical forms to Jennifer Oliver, 3307 128th Street E., Tacoma WA 98446. Jennifer can be reached at (253) 906-6078 or jenandmarv@yahoo.com . Camp Morehead is located near Nahcotta on the Long Beach Peninsula. The camp will run July 14-20 under the guidance of Tom Gwin (360-581-0177). Registration fees will be $160 if received prior to June 15 and $180 if received after June 15. Send fees and forms to Tom Gwin, PO Box 181, Humptulips WA 98552. Checks should be made payable to Morehead Junior Grange Camp. Camp David Jr. has two sessions scheduled for this year, July 7-12 and July 21-26. Camp fees are set at $150 for those with a Grange affiliation and $180 for those without a Grange affiliation. Registration must be completed online at https://grangecamp.org . The camp director is Chrissy Kelley, 1308 South A Street, Port Angeles WA 98363. Telephone (360) 452-8028 or email grandpas_twerp@hotmail.com . Camp NEWA will be held near Colville on July 21-27. For registrations received by July 1, the cost will be $150. After July 1, the fee will be $175. Registrations forms and fees should be sent to Kendra Meeker, 2727 E. 53rd Avenue, Apt D203, Spokane WA 99223. Make checks payable to NEWA Junior Grange. The camp director is Carol Evans, (509) 535-1165. The final camp of the season will be Cornet Bay Junior Grange Camp, held at Deception Pass on August 4-9. The registration fee is $150 if received before July 1 and $175 if received after July 1. Send checks (payable to Northern District Junior Grange Camp) and registration materials to Kathy Knott, 29415 218th Place SE, Black Diamond WA 98010. The camp director is Janelle Lierman, (425) 745-2180 or email jmlierman@hotmail.com. Potential campers should check the brochures on each camp for a list of items to bring and a list of items not to bring to camp. Grangers are encouraged to volunteer to help with the camps. They are also requested to visit the camps in their area, especially for the designated Visitor’s Program. There is a guest charge for dinner, other meals, and overnight stays. Remember, the child needs no prior Grange affiliation to enjoy the summer camping experience. Spread the word about this Grange camping opportunity! The members of East Oakville Grange #902, located in the tiny town of Oakville in the Southeast corner of Grays Harbor County, voted to close their Grange in January 2018. The vote was made after the Oakville Food Bank decided to close their doors. The food bank has operated out of the Grange hall for several years. Less than one year later, a group of young energetic citizens of their community contacted the WA State Grange Office regarding the possibility of reorganizing the Grange in their community. State Grange Master Tom Gwin and State Deputy Master for Grays Harbor and Pacific Counties, Lucy Vest, met with the group in December to explain the process for bringing the East Oakville Grange back to life. As the Grange had not been officially closed, a simple revitalization movement was all that was needed to move forward. The first meeting of the revitalized East Oakville Grange was scheduled for January 31. In addition to the State Master and Deputy Master, National Grange Communications Director Amanda Brozana Rios and Pomona Grange Master Davona Gwin attended the meeting. Membership applications were presented for 13 new regular members and three 1+ Junior members. Officers were elected, dues were paid, meeting dates and times set. and potential activities were discussed. Following the meeting, the group toured the Grange hall and got their first look inside the hall. 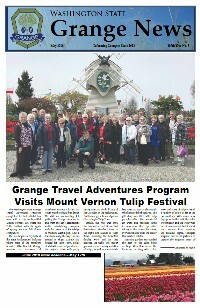 Three additional members joined the Grange at their February 21 meeting. Plans were made for work party to repair and clean the hall. The work party was held on March 24 with a large group in attendance. It is appropriate for each Pomona and Subordinate Grange in the state to develop their own mission statement. The National and State Granges have set the framework for you. Take some time to think about how your Grange serves your community, your projects and activities, and how you may want to work for the betterment of your community in the future. While many of our mission statements may be similar, every Grange and every community in our state are different from each other. Thus, our statements will have that same variation. In general, mission statements are 14-20 words in length. The statement should be relevant and reflective of the past, present and future of your organization. Key words, such as “enrich”, “strengthen” and “enhance” assist in defining your organization to others. I oftentimes hear that Granges are wanting to apply for grants to assist in improving their halls or supporting their projects. One of the first questions on many grant applications is to list the mission of your organization. Without the statement, your chances of receiving the grant are greatly diminished. The mission statement should be reviewed periodically to determine if it is still pertinent and reflective of your Grange’s goals and objectives. Feel free to update your statement or make necessary changes. Once you have developed your mission statement, I ask that you share that statement with the WA State Grange. Send us a copy. We will share with other Granges across the state in hopes of giving them direction and providing insight as to how each Grange operates and works with their community. I am looking forward to receiving your statement and learning more about the Grange’s roles in your community. The good news is that Washington State’s presidential primary will be more relevant on the national stage because it will be held the second Tuesday in March during presidential election years. The bad news is that the bill that changes the date, ESB 5273, also requires voters to check a box that says Republican or Democrat before they can get a ballot. Voters will be allowed to vote only for candidates from their chosen party. Each party will determine which names are on the ballot. Government agencies and political parties are allowed to keep records that link voters' names to their declared political party affiliation. This applies to the presidential primary only. Fall elections will remain as is. The bill passed the legislature March 4 and was signed into law by Governor Inslee on March 14. How will Livestock be identified? The House of Representatives passed HB 2075 which removed the authority of the department of agriculture to conduct livestock brand inspections. The inspection program has been running a financial deficit for several years. The department has had to use funds from other programs to cover the cost. The governor's office directed the department to propose this legislation because of the ongoing deficit. In addition to removing the authority to conduct brand inspections, the bill also repeals inspection fees, deletes provisions requiring identification certificates for livestock, and repeals the certified feedlot statute. Fees for the livestock inspections have not increased since 2011. The department of agriculture is hopeful that a solution can be found, and the program saved before the end of the legislative session. Another hope for the program lies in senate bill ESSB 5959 which would revise the livestock identification law by creating a program for private certified livestock inspectors and increase fees. SHB 1196 would allow Washington State to stay on daylight saving time all year, if federal law changes to allow the state to do so. This bill has passed the House and is now moving through the Senate. ESSB 5139 would also keep Washington State on daylight saving time year-round if congress allows it but would require a vote of the people during the next general election to approve it. Some studies show there are more accidents, heart attacks and strokes after the time changes twice a year. California and Oregon are also taking steps to stay on daylight saving time year-round. Hawaii and most of Arizona currently opt out of daylight savings time. Legislation has been introduced in Congress to allow states to remain on daylight saving time year-round. ESSB 5323 would prohibit retail stores statewide from providing customers with single-use plastic bags. It authorizes retail stores to provide paper carryout bags and reusable plastic bags but requires them to collect from customers a per bag charge of eight cents per bag. The original bill required a 10 cent per bag fee. Pulp and paper mills were adamantly opposed to this because surveys show that most customers will not pay the fee resulting in drastically reduced use of paper bags. The bill also requires paper bags to contain at least 40% recycled material and be capable of composting. Plastic carryout bags must also be made of at least 40% recycled material and be reusable and washable. Food banks and food assistance programs are exempt. The legislative session ends April 28. Proposed budgets are due out soon.